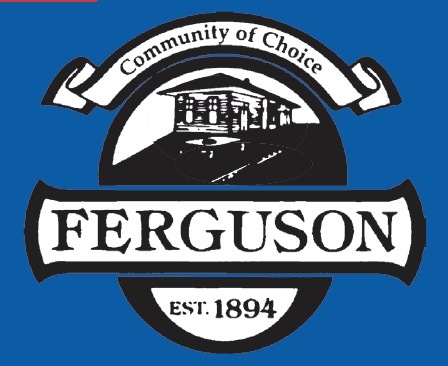 The straightforward monochromatic city seal for Ferguson, Mo., contains the town’s name, date of incorporation, motto — “Community of Choice” — and a representation of the railway station that started it all. The tenor of the seal reflects the no-nonsense dealings of William B. Ferguson, a shrewd entrepreneur who founded the city. In 1855, as railways were extending westward, Ferguson consented to deed a 10-acre strip of his land to the North Missouri Railroad, later known as the Wabash Railroad. But he insisted on one stipulation: the railroad was to build a depot on the land as a regular stop for trains heading to and from St. Louis, Mo., 14 miles to the south. The railroad agreed and Ferguson Station became the first rail station directly connected to St. Louis. Business was brisk, and the depot became a dynamically busy stop by the end of the decade. With the community centerpiece firmly in place, Ferguson began to divide and sell the rest of his land to prospective businesses and homeowners. Ferguson Station’s population grew rapidly during it fledgling years. The 1880 census recorded a population of 185, which tripled in the following 10 years. By 1900 more than 1,000 people lived in the town, which was incorporated as Ferguson in 1894. By the end of the 1800s, half a dozen passenger trains a day served commuters who worked in St. Louis, and Ferguson became a popular location for suburban executive homes. The population doubled again between 1920 and 1930, and experienced an additional boom aft er World War II. The most recent census in 2010 revealed a population of 21,203. The depot was the first communal meeting place for churches and organizations and served as the town’s only voting location. The community fire alarm was an engine whistle from one of the ubiquitous trains in the rail yard. The whistle also signaled noon and suppertime, heralded in the new year and announced the end of both world wars. At its peak, the station was staffed 24/7 and served 42 freight and passenger trains a day. The freight junction closed in 1948 and passenger rail service ended in 1960. The railroad ceased use of the building in 1988. The city purchased the building in 1991 for $1. The station has been renovated and now houses an ice cream parlor. For more information, visit www.fergusoncity.com.